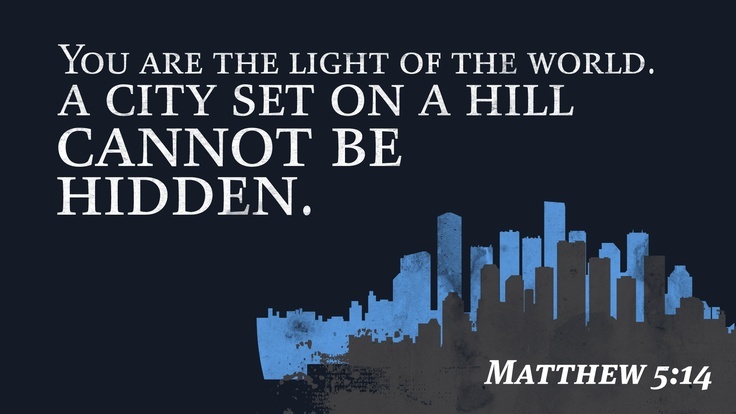 “You are the light of the world… the salt of the earth… a city on a hill…” When Jesus wanted to describe his disciples’ relationship with their surroundings, He used metaphors like these. Do you notice a common theme? Each idea implies that we are to cause an impact… to make a difference. In a dark room one little match can make a big difference, to say nothing of the impact of a whole city of light! In the same vein, just a pinch of salt can have a BIG effect on how our food tastes, and lots of salt means LOTS of thirst. Get the idea? What I’m getting at is that, as Christians, we are called to influence our surroundings… to exercise leadership over them just like God commanded Adam in Genesis 1. Maybe you don’t feel like much of a leader (I know I didn’t), but if you are a Christian (which literally means, “Little Christ”), I’m convinced that this is a huge part of your calling. If you think about it, basic biblical principles like the Great Commission, the Great Commandment and even the Golden Rule are pretty counter-cultural in our day and age (even if they are paid lip-service in some circles). This means that to obey them is to swim upstream… against the flow of the culture we live in, and following the currents of the Culture of the Kingdom. To swim upstream is to influence, and influence is the essence of leadership. Let me say it again: as a Christian, you are called to lead. Now, please don’t misunderstand me. I am NOT advocating the idea that every Christian needs to go into government or politics… or business management… or teaching… or church work… or healthcare … or any specific field in order to lead, but rather that they lead (influence for the Kingdom of God) in whatever sphere God has placed them. This was a huge paradigm shift for me, as I never saw leadership as one of my natural gifts. However, the more I understood God’s calling on my life (a subject I’ve meditated on for the past 25 years or so), the more clarity I’ve gotten on this issue of leadership. You don’t need to feel like a leader any more than that thing parked in your garage needs to feel like an automobile in order to function like one. The key here is to understand that you already are exercising influence on your surroundings whether you know it or not, so you might as well get intentional about it and START LEADING. Start leading your children and your spouse… start leading your co-workers and even your boss… start leading your friends, neighbors and relatives… start leading yourself. Wherever you are, start leading for the Kingdom of God! Can you hear Jesus calling you? Can you see his claims that you are salt and light more clearly now? That’s right, Christ-follower, you were born (again) to lead!!! Every Christian is a missionary… we’re ALL called to affect the spheres God has placed us in with the light of His Kingdom. Rise up, Church! Enjoying Bringing Lasting Change to Broken Lives? Consider sponsoring this website!